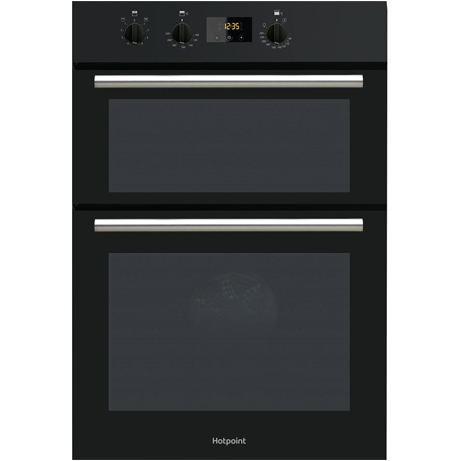 This Hotpoint Double Oven in Black is a perfect addition to your home. Delve into bigger culinary adventures with the super capacity of the this Hotpoint Built-In Electric Double Oven. 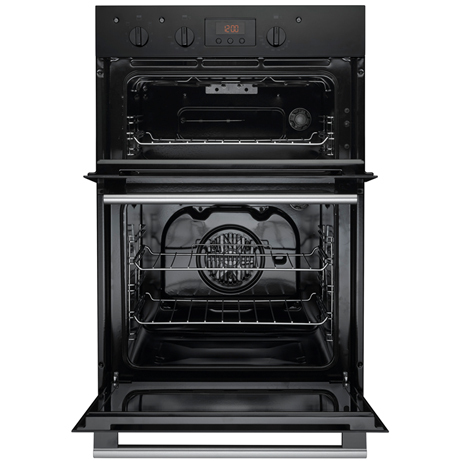 Enjoy 74L of capacity in the main oven and three automatic functions to facilitate Multi-Level Cooking, Slow Cooking and Defrosting with ease. Thanks the Circulaire Fan, reduce cooking time by 20% through a clever combination of fan and rear element heat production to ensure even cooking between the shelves. A great function if you love to batch bake or create delicious pastries. 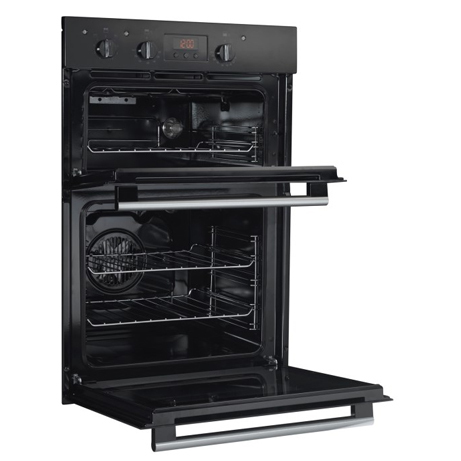 Within the top oven, as well as an extra 42L of cooking space, choose between traditional cooking and grilling. Including three shelves plus a grill pan, the Hotpoint Built-Under Double Electric Oven offers everything you need for creating tasty dishes. Whether you’re roasting or baking, you can enjoy reliable results in the main oven cavity with fan heating, which circulates an even temperature throughout all levels. Not only can you avoid under and overcooking, you can also speed up cooking times so you can spend more time enjoying your meals. There’s no need for hours of scrubbing or expensive oven cleaners as the easy clean enamel liners perform all of the hard work for you. Featured in both oven cavities, food and grime is prevented from burning onto interior side walls so all you have to do is wipe away any residue with a damp cloth. Entertain all of your family and friends and prepare larger meals with ease, as this built-in Hotpoint features a generous 74 litre main oven capacity and an extra 42 litres in the second oven. You can also cook efficiently and make savings on your household utility bills as this appliance offers an A energy efficiency rating.